Hi there. As I mentioned earlier, I have a dragon problem. I hate being too one dimensional with my paper mache. So I made a goal of finishing three non-dragon projects before allowing myself to get back to dragons. This is the third and final. I’m sorry if you’ve been waiting for Drogon. I swear, next post will be back with him. 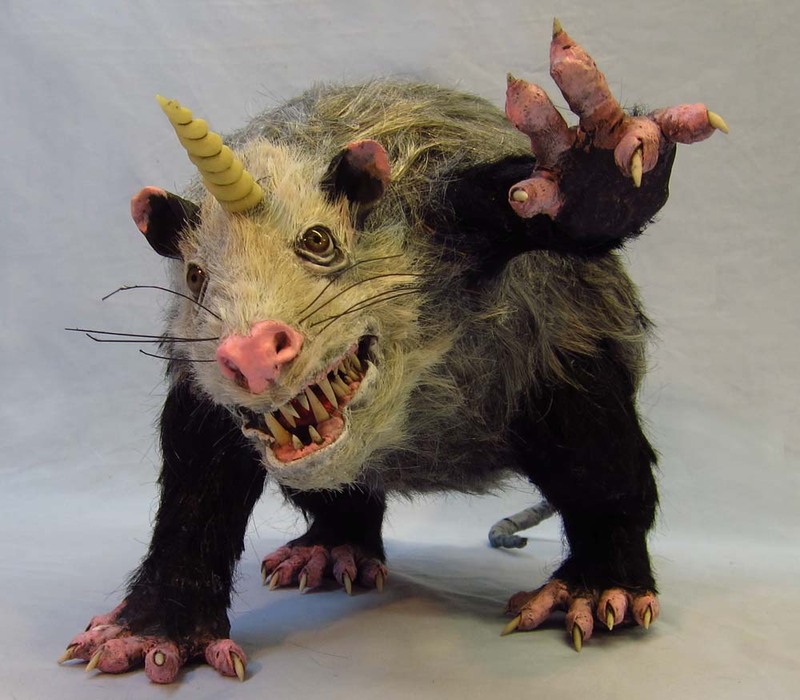 Here is the mystical, magical “Unipossum”. Doing this hair was fun. I used three different human wigs. I hot glued patches, then I gave him a haircut. 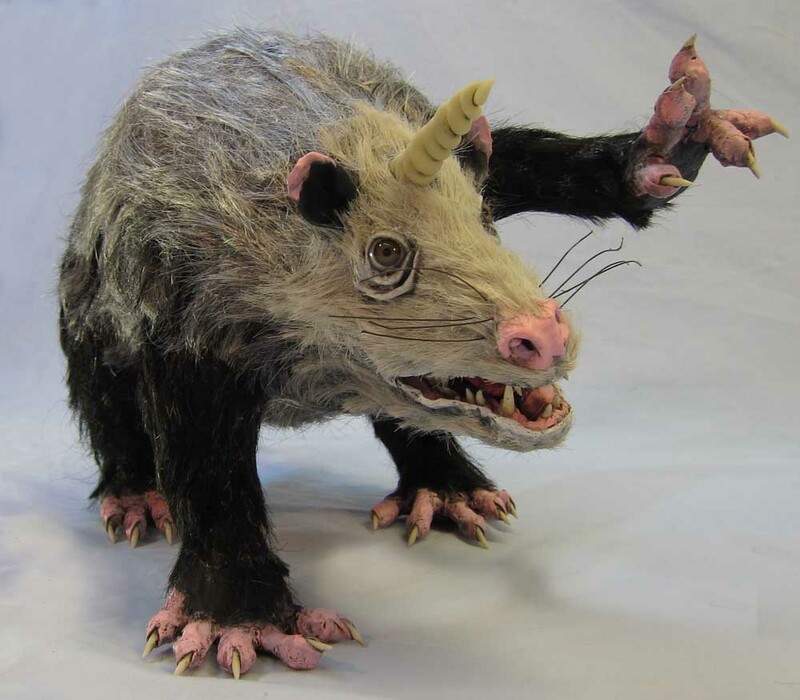 This entry was posted in Paper Mache Unipossum and tagged creepy, fantasy, mixed media, nocturnal, paper crafts, paper mache, paper mache instructions, papier mache, papier mache recipes, sculpture. Bookmark the permalink. Hahaha, OMG your imagination is out of this world Dan! He is fabulous, are you going to show the steps for this one? They do have pointy teeth, great representation! What a character!! Hey Suz! It’s always nice to hear from you! One of the reasons it always takes me so long to make a project is because I photograph and video the process just in case I decide to use them later. I decided to make a video of this one because I had the raw footage. I never know what to do with this blog. I’m so right brain about it all. I have photos that show steps for this. I just don’t know if that’s what people would like to see. Meanwhile I have to finish Drogon. Thanks for stopping by. Hope you are doing art. Very cool. I’d love to see your process for the hair. Hi Anonamix. You can see a little of the process on the video. I just squirt some hot glue on the project and then add a chunk of hair. Nothing too complicated. LOVE the Unipossum!! I’m planning a series of mythical creatures, as soon as I finish my pterodactyl. I’m going to put them in the patio in place of the pots of plants, because they won’t need watering. Well, it’s a thought. Thanks Linda. Mythical creatures are a giant well to draw from. My Minotaur came from that genre. Someday I want to make a Medussa and a Hydra and maybe a Griffin. So many possibilities. Good luck with yours! Hi Karen. Thanks! About the hair. I used a couple of wigs that women actually used to wear. But I got them years ago at Thrift stores. They don’t sell those anymore. Probably not healthy. I don’t know if it’s really human hair or not. I even once got a 3 foot long, grey, real human hair pony tail from a Thrift store! Unbelievable. I used that on so many projects including a bust of Einstein. One of these wigs was the kind you buy for Halloween. I’m sure it’s synthetic. So the answer is probably all of the above. I like going to second hand stores in the small, outlying towns in the state because they still carry stuff like that. Thanks, Dan! I’d love to try this technique. I’ll start keeping an eye out in thrift stores from now on, and eyeing my friends with long hair and trying to convince them they’d look better in a short do.Buwahaha! It just goes to show that with paper mache anything is unipossible! Really cool. You are too funny Lyman! Nice to hear from you. Hope you are well and making your cool art! Hey Dan, Love the unipossum. You said you were making three projects before back to dragons. Am I missing something? I can only count two: the shark, and the unipossum. Which one am I missing? Hey Willow. So nice to hear from you. The Minotaur (Screamer) was the first of three. Then the shark, then the unipossum. This is great! I love what you’ve done with the wigs. They are just perfect for the fur on this thing. I think your dragon problem might be contagious – I’ve got another dragon project in the works too. You are funny Stella! So we both have dragon problems. We should start a 12 step group or something. Look forward to seeing it! Thanks for stopping by. Yes, admitting it is the first step in getting better. This is amazing tool! You have been extremely busy! Very glad you like this Cat! Somehow I missed this one, Dan, but she’s a doozie! What a great character. 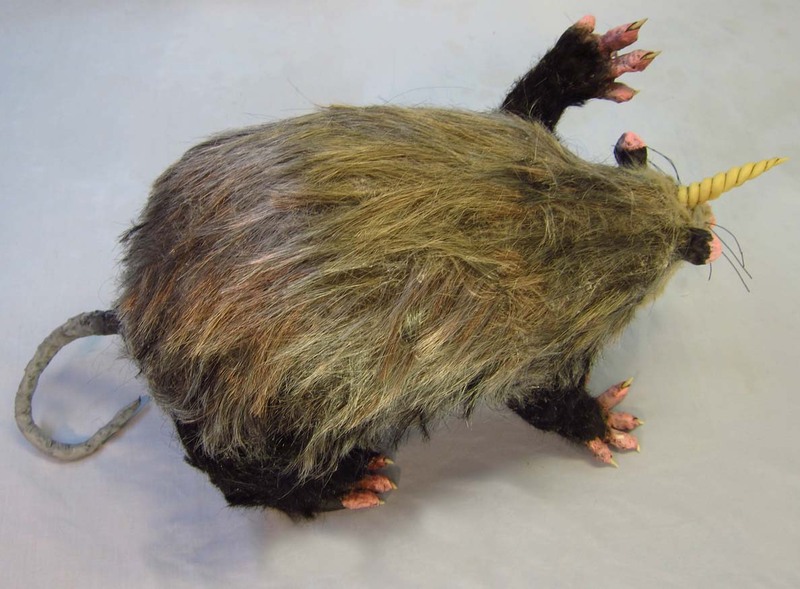 Your opossums are very different from our Aussie possums, though ours would work well too. The horn is a wonderful addition and the hair is brilliant. Glad you like this goofy little creature Carol. It was fun to make.